Ah! Where did Alex Jennings go? 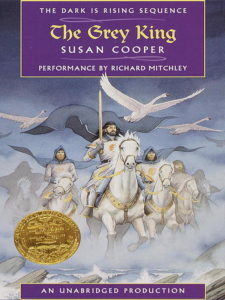 After listening to the same narrator for the first three audiobooks in the series, I was initially jolted to hear a different voice for The Grey King. I thought nobody would do as well with this book as Alex Jennings had been doing. But happily, I soon accepted Richard Mitchley’s voice and as the story unfolded, it made a lot of sense to have a different narrator. Although, Will Stanton was in the previous two books, The Dark is Rising and Greenwitch, in this book he loses part of his mind to illness for awhile and travels to family in Wales to recover. So here, Welsh is the language for the landscape and native language of the other characters. Having never heard Welsh, I have to assume that Richard was doing a good job with the difficult pronunciations and accents of Welsh people speaking English. Richard gave it a different feel that complemented the new setting. At first it is a bit of a disappointment, that Will is on his own. The Drew children are not in this book at all and Merriman only appears in a minor role. But we are introduced to interesting new characters, mainly another boy Will’s age, Bran Davis. Bran is an albino with a strict father and a somewhat magical dog, Cafall. Dogs and dog-like creatures have major roles in this book, for both the Light and the Dark. But, sadly, still no significant female characters.